We have many guests that travel with us that want to try the legendary fly fishing of Patagonia. The Futaleufu headwaters start in National Park Los Alerces in Argentina, and flow towards the Pacific into Chile. This unique turquoise river is surrounded by lakes, tributaries, glacier-crowned mountains, and lush plant life. Such ambiance creates a unique fly fishing destination that allows you and your family or group to participate in World Class river sports and adventure activities. The Chilean national record Brown trout was caught on the Futaleufu and the river is known for Brook, Brown and Rainbow trout. There are sections of the river ideal for whitewater and other calm sections ideal for fly fishing. The Argentine portion of the Futaleufu lies in the rain shadow of the Andes and has significantly drier weather than the Chilean side. Located on the banks of the Futaleufu river in Argentina, and within minutes of the the border, there is the luxury lodge dedicated to fly fishing: Sendero Lodge. You can embark on river trips right from the lodge, or go upstream and float back to the lodge. This is home for our guests that want to add fly fishing before or after their Expediciones Chile trip. In Chile, located beneath the Tres Monjas Peaks in the heart of the Futaleufu Valley, lies our Campo Tres Monjas at the confluence of the Futaleufu and with Rio Azul. This is our base for our kayaking and rafting trips. When you stay here you can have access to to the shoreline on both the Azul and the Futaleufu. You can fly fish in the evening after your river trip. You can also arrange to have a raft take you out in the evenings near the camp. We travel in 4X4 vehicles, on horses and rafts to fish in some of the most spectacular places you can imagine on the nearby Futaleufu, the Azul and the Espolón rivers and to the Espolón, Lonconao and Yelcho lakes, home to abundant wild populations of browns, brookies and rainbows. These are some of the best waters for fly fishing in Chile. Our average catch is between one and four pounds, although a twelve-pound and its strong fighting occasionally becomes the highlight of the day. Salmon in November and December may run as large as 40lbs. Dry flies, a wide variety of streamers, stone flies, nymphs, grasshoppers, damsels, mosquitoes and old standbys like wooly buggers have been successful in the area. Argentina Fly Fishing: Our access to the upper Rio Futaleufu is a short distance from the village of Futaleufu near the Argentinian border. The headwaters of this river are located in Los Alerces national park in Argentina. The Rio Futaleufu originates from the magnificient Lago Futalaufquen and is broad and flat before plunging into the Class V rapids of the Infernio Canyon. The Rio Grande and Futaleufu provide some of the best fly fishing in Patagonia. From our raft we will enjoy a great day of Argentina fly fishing that is not possible from the shoreline. We will navigate the mild class II rapids of the upper Futaleufu and stop to fish and wade throughout our journey. We will eat a prepared lunch along the riverside and at days end we will take out directly above the awe inspiring rapids leading to the Infernio Canyon. Fly Fishing in Chile: The Rio Futaleufu connects Lago Futalaufquen in Argentina with the famous Chile fly fishing lake, Lago Yelcho, in Chile. At the end of the specatuclar whitewater sections of the Rio Futaleufu there are five miles of relatively flat water, home to abundant rainbow trout, brown trout and salmon. We willl raft from El Macal to the village of Puerto Ramirez and fly fish the entire day, taking our lunch riverside. Fly Fishing Chile: From our village lodge or from our CondorNest ranch we can access the calm pool below the thundering Throne Room rapid. Here we will fish from a raft at the bottom of one of the most spectacular rapids in the world. Great fly fishing in Chile and a great horseback ride through narrow trails, across small rivers and old growth forest. Lunch will be served riverside. Chilean Patagonia Fly Fishing: Lago Espolon is a glacier ringed alpine lake, the headwaters of the Rio Espolon. The Rio Espolon in turn is a tributary of the Rio Futaleufu, joining that river below the Infernio Canyon. Lago Espolon is a very productive Patagonia fly fishing area usually early in the day, since wind starts blowing as midday approaches. As the day goes by, we will move down the watershed to the Rio Espolon and fish the strong currents of the river. Fishing here is always challenging because of the difficult terrain but very productive. We will eat lunch by the river and spend the afternoon fishing the Rio Espolón, from shore or from a raft or kayak. Your choice! Fly Fishing Patagonia, Chile: Only fifteen minutes from town, this small alpine lake is a productive trout fishing area. Big enough for one or two boats maximum and is well protected from wind. It is a great Chile fly fishing option in case windy weather makes more open venues too difficult. Fly Fishing in Patagonia, Chile: A spectacular turquoise blue river where fly fishing Chile becomes more meaningful and magical than in many other places. The Rio Azul is a tributary of the Futaleufu and joins that river about midway between Lago Futalaufquen and Lago Yelcho. The headwaters of the Rio Azul are directly glacial fed, with few lakes in between; and, a result the water here is colder, and somewhat siltier, than many of the other rivers in the region - but the Patagonia fly fishing can be spectacular. We will fish here all day along the banks of the river - making progress downstream by raft or horseback. A prepared lunch will be served stream-side. Chile Fly Fishing: A great destination for a two-day fly fishing in Chile trip, this lake can be accessed by foot or on horses only. Lago Las Rosas is a hidden lake about four hours from the village of Futaleufú great for fishing, sightseeing and photo taking. Lodging options are a familly run ranch or camping out under the stars. Lago Yelcho - wading, rafting, float tubes, pontoons, drift boats, jet boats, and river boats. Fly Fishing Chile: Lago Yelcho is world famous for its incredibly productive trout fishery. This spectacular Norwegian fjord-like lake is about two hours drive from the village of Futaleufu. Expediciones Chile brings you two unique ways to to fish this magical Patagonian lake. From the Isla Monita fishing lodge you have access to the entire lake with the lodges' wide selection of motorized boats. Fly Fishing in Chile: We also offer a fly fishing in Patagonia sea kayak option which combines expedition style sea kayaking with incredible Chile fly fishing. This option is a full blown sea kayaking/fishing expedition that will get you to the remotest corners of Lago Yelcho under your own power. Typically we spend three days sea kayaking and fishing on this magical lake. You will camp out on the beach in tents under the stars and paddle and fish some of the most spectacular water in the world. (Depending on the planned route, options can be made for indoor lodging.) Three (or more) days. Chilean Patagonia Fly Fishing: The Yelcho River has as its headwaters the Lago Yelcho and the Rio Futaleufu. About on third bigger than the Futaleufu, the Yelcho is joined by many smaller tributaries that contribute to its higher volume. The river itself is about 25 miles long with a shallow gradient. The Patagonia fly fishing here is excellent as fish concentrate at the sourace around the large whirlpools that serve as conduits for insects. Despite the abundant numbers of fish, finding the right fly patterns is the secret to fishing the Rio Yelcho. 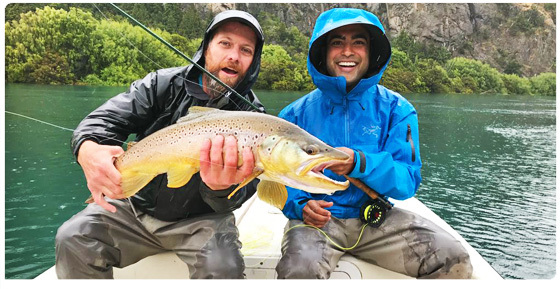 Fly Fishing Patagonia Chile: During certain times of the season, when fishing is most productive, we will make excursions over to the Rio Palena. The Palena valley is one of the remotest areas in this region of Patagonia. At the headwaters the landscape resembles the arid Argentine Pampas, but as the river heads toward the Pacific the vegtation becomes almost jungle like. On the Rio Palena you can be sure of finding water where trout have never seen an artificial fly. The Rio Palena offers remote fly fishing Chile at is best! Fly Fishing in Patagonia Chile: From Isla Monita fishing lodge we will head over to the Rio Figueroa. The Figueroa serves as the headwaters of Lago Rosselot which joins with the Rio Palena at the village of La Junta. The headwaters of the Rio Figueroa are Lago Verde and other small tributaries originating in Argentina. During certain times of the season we will fly fish these waters for brown, brook and rainbow, trout. In addition, sea-run browns and various species of Salmon can also be caught in the Figueroa. Fly Fishing in Argentina: Los Alerces National Park is about two hours from Esquel, Argentina and four hours from Bariloche, Argentina. It is one of Argentina’s most scenic national parks and serves as the headwaters of the Rio Futaleufu. For Argentina fly fishing Parque Nacional Los Alceres can't be beat. It contains five lakes, three rivers and two smaller creeks. The fishing here is for brown and rainbow trout that average about 20 inches in size. Rio Carrileufu and Rivadavia are famous for their land-locked salmon. For Argentina Fly Fishing, Alerces Park can't be topped. Argentina Fly Fishing: The Rio Frey connects Lago Kruger with the man made hydroelectric reservoir Amutui Quimei which directly feeds the Rio Futaleufu. The Frey is the biggest river in Los Alerces but also one of the most difficult to access. .Getting to it involves two lake crossings and usually a horseback ride. However, fishing pressure here is light and the journey well worth the effort. Difficult casting from shore makes the Frey best for experienced anglers only. A great fly fishing Argentina destination. Fly Fishing Argentina: The very short Rio Arraynes connects Lago Verde to Lago Futalaufquen. The Arrayanes is about five miles long and only flows at adequate levels when Lago Verde is high enough. The Arrayanes is an excellent Spring time river productive for browns and rainbows. When water levels drop we will often fish the mouth of the Arrayanes in Lago Futalaufquen. Rio Arrayanes is a great Patagonia fly fishing option. 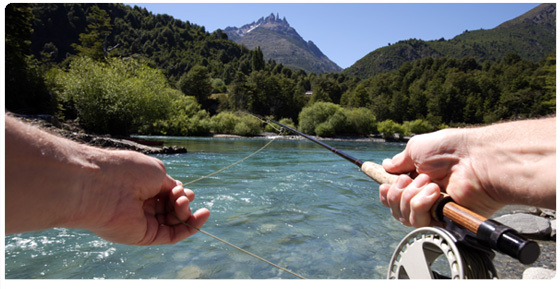 Other Fly Fishing in Patagonia options include: Fly Fishing the Futaleufu in Argentina. Fly fishing the Futaleufu in Chile. 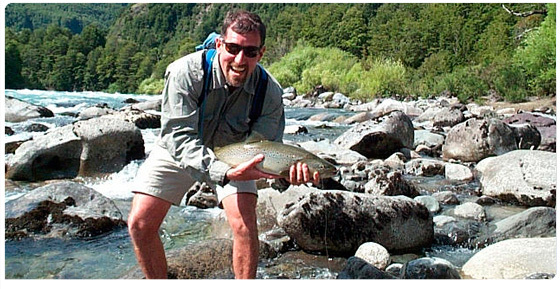 All of our programs adhere to our Catch & Release Guidelines for Fly Fishing in Chile.